As the retail market becomes less certain, mixed-use developers look to other ways to boost foot traffic and create a destination. Online retail sales are having a mixed impact on urbanism. 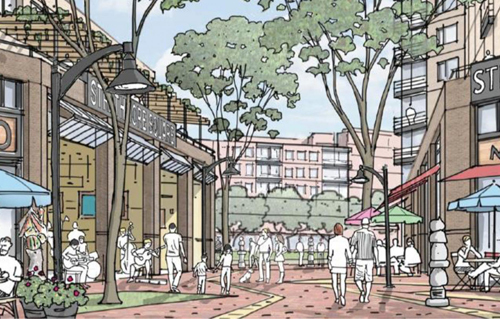 Downtowns are thriving, but many walkable mixed-use centers in the suburbs are struggling, says retail expert and urbanist Bob Gibbs of Gibbs Planning. Some mixed-use developments are focusing on “experience” to create foot traffic and active public spaces. 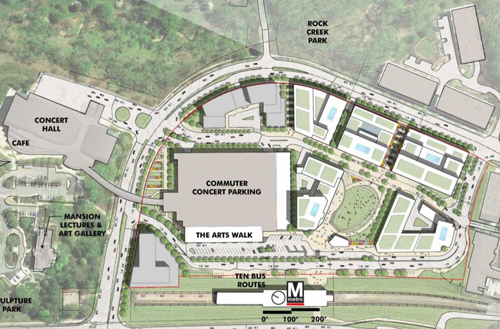 Strathmore Square plan, by Perkins Eastman DC for Fivesquares Development. The civic green is standard New Urbanism. Shunning national stores is unusual, although it is in line with new thinking that creating a unique experience is critical to success of retail. Small retail stores can’t just offer standard goods you could easily get delivered; they need to offer something local, fresh, or luxurious, with excellent customer service, Gibbs told The Boston Globe, which ran a piece a month ago on this trend. What’s outside the store is also important. “In order to compete with the Internet, the downtowns need to be beautiful,” he says. The impact of online sales shouldn’t be overstated—they only represent about 10 percent of retail sales. But the Internet is having a selective impact on segments of the retail marketplace. “It’s been a killer … for shopping malls,” where anchors like Sears and Bon-Ton are disappearing, says Gibbs. Yet many suburban mixed-use centers are also struggling, primarily due to bad design and bad location. “When they work, the retail residential, office and hotels produce above market rents,” he says. The retail in mixed-use urban centers needs to adhere to fundamental shopping center principles, he explains in an email to Public Square. “Mostly, they need a green grocery, a street with parking, anchors, some surface lots, office, a hotel, etc.”About 30 percent of his firm’s business “stems from advising banks on how failing or underperforming suburban town centers can turn things around — a line of business practically unheard of 10 years ago,” he told the Post. Mixed-use urban centers in the suburbs continue to be built, driven by a number of trends. Employers are locating in such centers because that’s where their employees want to be, the Post points out. Municipalities, also, are looking to revitalize inner-ring suburbs. As shopping malls die, this will open more opportunities for revitalization. Finally, the residential market for walkable places is strong. Mixed-use centers have long relied on retail to provide the draw, but the retail industry is in flux today. Many mixed-use developers are therefore “focusing on more ‘experiential’ ways to attract people and hold on to them long enough that they’ll browse and buy instead of stay home and click. Providing experience now goes well beyond the traditional winter ice rink or summer movie night,” says the Post. To a degree, “experience” has always been a tool in the new urbanist toolbox. Today, that tool is becoming even more important.